Making and receiving a call is simple and convenient using voice commands, multimedia commander or touch screen. 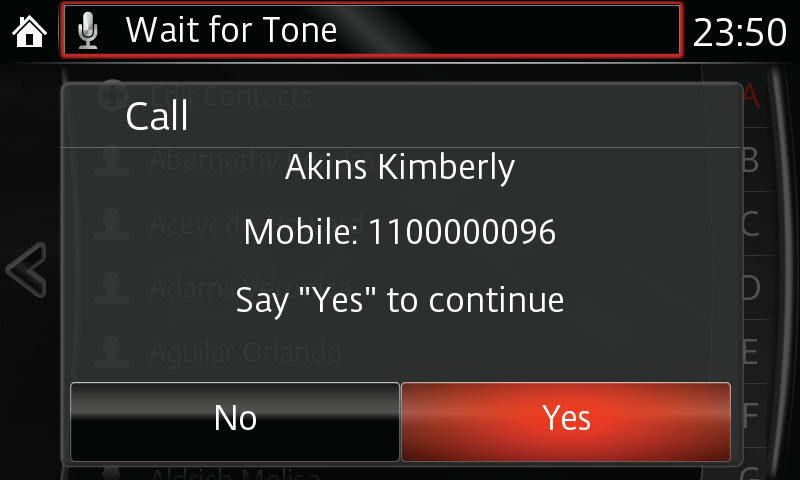 Simply follow the prompts on the screen or activate voice recognition using the button on your steering wheel. You may review a list of commands that can be spoken at any time in the menu. Click here to view, print or download a pdf list of global commands. To get started using the voice recognition system, just follow these simple commands. The system will walk you through the rest of the commands with ease. Press the call pickup button on your steering wheel. Say "REDIAL" to call the last contact dialed. Say "CALL BACK" to call the last person who called you. Say "GO TO CONTACTS" or "SHOW CONTACTS" to display contact list. Say "RECENT CALLS" to display call history. – If the ignition is turned off during a hands-free call, the call is transferred to the mobile phone automatically. – Practice while vehicle is parked until you are confident you can make a call via the Bluetooth® system. Until you are completely comfortable, make all calls while safely parked, moving only when you can devote your full attention to driving.